1 Animal Science Department/Departamento de Zootecnia, Universidade Federal de Viçosa (UFV), 36571-000 Viçosa, MG, Brazil; 2 Agricultural Engineering Department/Departamento de Engenharia Agricola, Universidade Federal de Viçosa (UFV), 36571-000 Viçosa, MG, Brazil 3; INRA, Unité de Recherches Zootechniques INRA UR143, F-97170 Petit Bourg, Guadeloupe, French West Indies, France; 4 INRA, UMR Systèmes d'Elevage, Nutrition Animale et Humaine INRA UMR 1079, F-35590 St Gilles, France. Fifty nine primiparous sows PIC Camborough 23 were distributed in a completely randomized 2 × 2 (with and without floor cooling ×two dietary treatments) factorial design with 16 sows/treatment, each sow being considered as an experimental unit. Four replicates of sixteen sows each were used during the trial with the objective of evaluating the effects of floor cooling and the use of dietary amino acid contents on their performance and behaviour during summer. The sows were distributed among the treatments according to body weight and backfat thickness after farrowing. The sows were maintained in the experiment until weaning at 21 days of lactation. 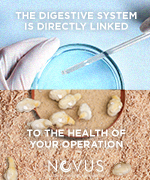 The two experimental diets supplied the same levels of crude protein (22%), metabolizable energy (ME; 14.65 MJ/kg) and levels of essential digestible AA relative to digestive lysine and differed according to the digestible lysine to ME ratio (0.75 vs. 0.82 g/MJ of ME). The temperature of the water circulating in the cooled floor was maintained at about 17 °C. Based on the average minimum and maximum temperatures (21.5 and 29.5 °C) obtained during the experimental trial, it can be assumed that the sows were exposed to periods of heat stress. The replicate and the interaction between replicate and treatment effects on all the measurements were not significant. Similarly, no effect of diet or interaction between diet and floor cooling system was found for all criteria measured. An effect (Pb0.05) of floor cooling on average daily feed intake was observed and floor cooling sows showed a higher average (Pb0.05) digestible lysine (61.5 vs. 51.8 g/d) and ME (78.2 vs. 65.9 MJ/d) intakes. The sows submitted to floor cooling showed, consistently, higher absolute values for average weight (+ 8.5 kg) and backfat (+ 0.75 mm) at weaning, compared with the control sows. 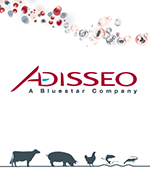 The sows submitted to the cooled floor showed a shorter (Pb0.01) weaning-to-oestrus interval. The piglet and litter's daily weight gain (DWG), average weight at weaning (AWW) and total weight gain during lactation (TWG) were higher (Pb0.01) for the floor cooling sows. The floor cooling sows showed a higher (Pb0.01) daily milk production. The respiratory rate and rectal temperature values were lower (Pb0.01) for the floor cooling sows. There were differences (Pb0.01) on the cutaneous temperatures measured on the different parts of the sow's body, with the animals submitted to the cooled floor having lower values. The sows submitted to floor cooling spent less (Pb0.01) time in lateral recumbency inactive, more time nursing (Pb0.05) and more time feeding (Pb0.01) compared with control sows. The floor cooling under the sows increased daily feed intake and lysine intake, leading to a lower body weight loss, a lower weaning-to-oestrus interval and also improved nursing behaviour of the sows, leading to a higher milk production and, consequently, higher weight gains of piglets and litter during the lactation period. 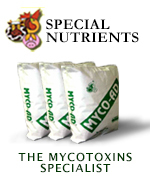 Keywords: Sow; Floor cooling; Lactation; Heat stress; Lysine. Abstract published in Livestock Science 120 (2009) 25–34. doi:10.1016/j.livsci.2008.04.015.